Yesterday at a book signing at Coles in Southgate Shopping Centre in Edmonton, AB, I was reminded of the power of words and what an honor it is to have written a novel that has affected so many. Although Whale Song is a work of fiction, it is also an inspired work that originated from a single, beautiful native legend--a legend that says that if you see a killer whale close to shore, it is really the reincarnated soul of a loved one who has come to say goodbye. 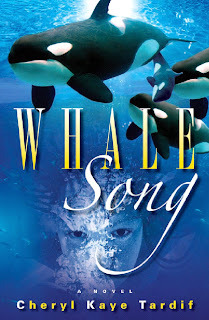 Whale Song is a novel of many things--of love, lies, family ties, sacrifice. It is also a novel of racial discrimination and conflict, and one of healing, caring and looking past color or race. At yesterday's signing I met numerous people who recognized me from recent TV interviews and newspaper features. I also met so many fans, especially Whale Song fans. I don't think I've ever met that many at one signing. A young teen came up to me and told me she loved Whale Song and that it was her favorite book. One man came up and asked if I had another novel out yet because his wife loved my work and was collecting my books. Another woman stopped by and told me how much she cried when she read Whale Song and how she was recommending it to all her friends. Then Hanid, a sweet woman (from India, I believe), whom I immediately recognized from a previous signing, came up to me and told me how much she had loved reading Whale Song. She said it had affected her so deeply that she thought about it for days afterward. She had bought a copy for herself and for her mom a few months ago and she "loved Whale Song too". Hanid said something that floored me. She said that she thinks I should have won the Nobel Peace Prize for Whale Song. Wow! We talked for about 15 minutes and I listened as she told me about my characters, the ones I'd created, describing them in such a way that showed how real the story was for her. Here was a reader who had connected deeply. To the characters and to the messages within. She left with two copies of Whale Song, and I was left feeling very blessed to have met such wonderful fans and very grateful to have made an impact--even a small one--on someone's life and thinking. My experience at this one signing really opened my eyes to the universal appeal of Whale Song. Those who had read it and loved it were from various nationalities and skin colors. Those who bought yesterday also came from different countries. I have seen international sales to many countries now--the US, England, France, Scotland, China, Japan, Australia, India, the Ukraine, Pakistan and more. English versions, no translations. Whale Song crosses racial boundaries because it deals with a young white girl who is thrown into a completely different culture--the native culture. This is a story of how friendships are made with open hearts, hearts that don't see skin color or race. Hearts that share their experiences and knowledge from different worlds maybe, but hearts that share, all the same. Whale Song knows no boundaries, and that is why I believe that people all over the world are reading it...and 'getting it'. Yesterday made me remember a project that one of my author friends is involved in. Luanne Rice wrote a lovely novel called What Matters Most and a website explores that sentiment too, allowing you to post 'What Matters Most' to you (I invite you to do so). Whale Song explores 'what matters most', and I think that is why it will continue to cross boundaries and dissolve racial discrimination. What matters most is love, caring, family...life. And for me...making a difference. If you send Whale Song as a gift to someone in another country as a gift, please let me know. It gives me immense pleasure to know that it is crossing boundaries everywhere. You can buy Whale Song at your favorite bookstore. If it isn't on the shelves, please ask them to order it in. Or you can order online from various retailers like Chapters.ca or Amazon.com. To everyone who stopped by my table yesterday, thank YOU. You all gifted me with your stories and your interest. And since a portion of my royalties from the sale of every Whale Song goes to 3 non-profit organizations, together we have made a difference. And believe me, talking to each of you has made a difference in my life. Yesterday, while signing books at Audreys Books in Edmonton, a fellow stopped by my table. We had an interesting discussion, especially when I found out that he was a translator. I told him how excited I will be when I see one of my novels translated into another language. Some of my author firneds have their books in multiple translations with varying covers per country. It's really very fascinating. In the end, he bought a copy of Whale Song for a friend, who is also a translator. I found out that Whale Song will be on its way to Ternopil, Ukraine, shortly and heading to the Chair of the Department of Translators at the Ternopil National University. I now have 3 bestselling novels on Amazon.com! How thrilling! After the recent success of my latest novel Whale Song, and after achieving bestsellers' status on Amazon.com and Amazon.ca with the title that I call "my heart book", I am happy to announce that both Divine Intervention and The River have made the list. Divine Intervention followed soon after, making Amazon.com's bestseller list in the Canadian Detectives category under Mystery and Thrillers bestsellers. Divine Intervention is a paranormal suspense that pits a group of covert psychic government agents against a deadly serial arsonist, sending them across BC, from Vancouver to Kelowna, Penticton and Victoria. Divine Intervention is popular with fans of J.D. Robb aka Nora Roberts, Kay Hooper and Allison Brennan. And more recently, The River, a conspiracy thriller that explores stem cell research and the search for the 'fountain of youth', made Amazon.com's list under...of all categories...Multiple Sclerosis. The River takes place in an area of Canada that has been referred to as "the Bermuda Triangle of Canada"--the Nahanni River area of the Northwest Territories. In The River, Del Hawthorne takes a group of near strangers up north to search for her father who went missing in the area and was presumed dead--seven years earlier. But something leads Del to believe that maybe her father isn't dead after all. For anyone dealing with multiple sclerosis, as does a special friend to whom this book is dedicated to and also one of the characters in the novel, I hope you find The River a journey of hope. Divine Intervention and The River are being sold together in Amazon's 'Better Together' program. The regular retail price of each is $22.50 US. Buy together now for only $30.60 US for both novels (almost a $15.00 savings!). Pick up your copies of Divine Intervention and The River on Amazon.com now. I ate my book cover! Yes, you read the title of this post correctly. I ate my book cover today...and it was delicious. Today I was at the 2nd Annual Local Authors Extravaganza in the West Side Chapters in Edmonton, Alberta. There were about 16 authors, including myself, at this event, and it was filled with energy and excitement. I sat at a table next to Drew Karpyshyn, bestselling author of the latest Star Wars novel. Further down the aisle was YA author Marty Chan, and up by the doors was the lovely Lynda Steele, a TV news personality from Global TV, where I've been interviewed a few times. Having so many authors in one place created a lot of buzz. Some of the customers came down just to see us; others were surprised to see our tables and wanted to know what was happening. Right around lunch time, I was getting hungry. So I ate my book cover. It was, as I mentioned before, very delicious. I was a bit worried about the blue dye. I thought it might stain my tongue...or my lips. Now, wouldn't that look funny? Imagine talking to an author with blue lips and a blue tongue. With the first bite of my cover, I thought about poor Sarah Richardson, the tormented young woman in my novel, and how her life was turned upside down by a single tragic event. I thought of her mother, wanting so desperately to end her own pain and suffering, and Sarah's father who was put in the position of having to make a life-changing decision. I took another bite of my book cover and thought of Annie, Sarah's childhood bully--the bully that most kids have at least once in their life...and I thought of the killer whales that Sarah saw in her dreams, the ones that called to her at night. My book cover tasted very sweet. Almost heavenly. Note: No plot spoilers in this review, unless you haven’t seen the movie trailer. Jodie Foster’s newest film venture is sure to bring her an award―or three. The Brave One is a fascinating character study and one that certainly allows for much discussion afterward. Foster (Silence of the Lambs) plays Erica Bain, popular radio host of a segment about New York called ‘Street Watch’. During the day, she takes to the streets, a recording device in hand as she records city noises, finding something interesting in the simplest sounds. Then in a semi-monotone voice, she talks about her own observations of city life on her show. Erica’s tone is mesmerizing and the audience is drawn in, comforted, made to feel safe, just as she feels. Until things change. Erica’s fiancé David, played by Naveen Andrews (LOST), is an ephemeral yet key character. While walking their dog and discussing future wedding plans, Erica and David are brutally attacked by three taunting thugs. Erica wakes up three weeks later, battered and bruised, only to discover that the man she loves is dead and buried. But David haunts her, his touch and music ever close, making for some very poignant and sorrowful scenes. Erica feels empty―dead inside. And the transformation begins. When asked how one recuperates from such terrible violence and loss, she says, “You don’t…you become someone else.” Suffering from a mild form of agoraphobia, she finds it difficult to leave her home. But when she finally does, she discovers that her once-loved city that seemed so safe is now something she dreads and fears. Every shadow, every person who brushes past her, every footstep behind her causes her to lose all security and faith. And justice is far from swift. So she buys a gun. This is the first pivotal, defining moment in the film, the point of no return where she takes that leap into the dark unknown. Erica is shopping at a convenience store when a furious husband walks in and shoots his wife who is standing behind the counter. Erica is spurred into action when the man begins to hunt her down in the store. What’s a gal to do? The fact that she shoots the man isn’t surprising. You know that’s coming. But you don’t expect her to marvel at how easy it was. Her hands don’t shake. Why does killing seem to come so easy to her? This one act of fury spawns a killing spree, and introduces Terrence Howard (Four Brothers) who plays Detective Mercer, a divorced cop who listens regularly to Erica’s radio show. His partner Detective Vitale (Nicky Katt) adds a bit of comic relief to this pensive, gritty movie directed by Neil Jordan. When Mercer finally begins to suspect who the vigilante is, the movie takes a twist, the ending not quite what many would expect and one that you’ll certainly remember. But it is Jodie Foster’s portrayal of a woman who feels she has nothing left to live for that will stay with you. You watch her transform from a light-hearted, flirty, loving woman to a cold, calculating, hardened shell. Is there any redemption for her, any salvation? You’ll have to watch the movie to find out. The Brave One reminded me somewhat of a novel I’d heard of recently. In author Lynn Hoffman’s novel bang Bang, a waitress who is against guns is devastated when a close friend is shot dead. She takes to the streets with a BB gun, targeting windshields of those who incur her wrath, especially those in the United Gun Association. I find that when a story is really told from the perspective of the main character, we are drawn in much further, not only to the plot but to the emotions and motives. In my own novel Whale Song, I explored a flawed character that, much like Foster’s Erica Bain, has closed herself off to those around her after the tragic death of her mother. Death, especially a violent one, tends to do that to people. As an educated society that has witnessed terrorism and an overwhelming daily diet of death broadcasted by our media, we can’t help but cheer these vigilantes. Certainly, none of us condone murder, but it’s in our human nature to yearn for the ‘bad guys’ to get what they deserve. That’s what made The Brave One so compelling and controversial. That’s what makes bang Bang a novel that the NRA might have an issue with. But it is the characters―flawed, defenseless, haunted, terrorized, grief-stricken―that bring these stories to life. I invite you to check out The Brave One at your nearest movie theatre, and for those cold winter nights, curl up with Lynn Hoffman’s bang Bang and my bestselling novel Whale Song, which you can buy on Amazon’s Better Together program. All three explore strong women who have learned to fight back in their own way―one with a gun, one with a BB gun and one with the truth. Cheryl Kaye Tardif is an Amazon bestselling author. Her recent release, Whale Song, has received rave reviews from Booklist, Midwest Book Reviews, Fresh Fiction and more, along with reviews from authors like New York Times bestselling author Luanne Rice. All of Cheryl’s novels have captured the interest of major film companies, and Whale Song is now in the hands of Hollywood producers and directors, as well as some highly acclaimed actors and singer-songwriters. When I attended a writer's conference and had the pleasure of meeting renowned book marketing expert and author Jerry D. Simmons. "Recently I was fortunate to meet author Cheryl Kaye Tardif and she graciously agreed to submit some of her fabulous articles to my newsletter. To read this week’s edition, click Creating a Character Wall ." "I kill people off for a living." That’s what I like to say when someone asks me what I do for a living. You don't want to miss reading the rest of this tongue-in-cheek post about mystery, murder, messages...and corpses. Author Karen Harrington invited me to share a bit about my mystery/suspense novels and while visiting Karen's blog A Writer's Diary, I decided to hold an impromptu and ‘deadly’ little contest. Check out Karen Harrington: A Writer's Diary. "Simply sublime. I agree with other reviewers that Whale Song is a touching and heartfelt story. The best possible kudos I can give this book are these: I will share this story with my own daughters when they come of age and will enjoy revisiting the story in years to come." During my August 2007 'Touring the World' virtual book tour, the following article appeared (although now slightly modified) on My Book, The Movie. I was very excited when I realized that I would have a chance to dream a bit and discuss a possible movie version of my novel Whale Song, a novel that is haunting, compelling, mysterious and emotional. Great components for a feature film! As I wrote the novel back in 2003, I could see the story roll across my inner vision, frame by frame, like a movie on slow motion. I saw the main character ‘Sarah’, who begins the story in the prologue as a mid-twenties ad exec. She then flashes back to her life as a child. In 2003, I imagined the younger Sarah being played by actress Mackenzie Rosman from TV’s 7th Heaven fame. Mackenzie has Sarah’s dark (Italian?) looks and tenacious spirit. But we’d need a younger actress to play Sarah now. I also had a clear picture of who would play the adult Sarah. Kristin Kreuk, ‘Lana’ from the popular TV show Smallville. Again, she has the darker coloring, and I think she’s a wonderful actress who knows how to pull off emotional scenes. Shortly after this article appeared on My Book, The Movie, I was contacted by a Kristin Kreuk fan who gave me the actress’ contact information. I sent out a brief email to her agent and was invited to send Kristin a copy of Whale Song, which I must admit, made my day. More recently, I came across a young woman who also makes me think of Sarah. I’m a Canadian Idol addict and last season’s winner, Eva Avila, was my personal favorite from day one. I’ve been emailing Eva, and she is actually reading Whale Song right now. In one of my emails I mentioned that she would make a perfect ‘Sarah’, and she commented back that she was actually looking to get into acting. The more I think about it, the more I think Whale Song would be a perfect role for Eva to start off her acting career. I would be pleased if either Eva or Kristin played my ‘Sarah’. For Adam, Sarah’s love interest, I always visualized Nathaniel Arcand as the adult Adam. Nathaniel is from North of 60 fame and has starred in numerous TV shows and films. But again, some years have passed now. I created the younger Adam somewhat around Zac Efron, the teen actor who played in TV’s Summerland, and more recently in Hairspray. I think Eva Avila and Zac Efron would make an intriguing combination. Whale Song has captured a lot of film interest. Currently, it is in the hands of numerous film producers, including some major players from Hollywood and one of Canada’s leading female producers. I know that the project has to be right for a producer; they have to envision it too. I know in my blood that Whale Song will make a great film. I know there won’t be many dry eyes at the end. I can imagine the movie score filled with Eva Avila tunes, along with music by my other talented friends—Alexia Melnychuk (singer) and Julie Blue (film composer). Whale Song is a movie waiting to happen. And I am waiting patiently for the right time, right producer. So until the movie is made, I hope you’ll pick up a copy of Whale Song, a haunting and compelling novel that will change the way you view life…and death. Order Whale Song from Amazon. Or you can order from any other online retailer, plus don’t forget your local bookstores, chains and independents. Start your Christmas shopping early and help others in need. A portion of my royalties from Whale Song goes to 3 organizations to help combat poverty, homelessness and addictions. Let a madman take your child, or watch your son die. This is the premise for bestselling author Cheryl Kaye Tardif's new UNPUBLISHED novel, Children of the Fog. Whale Song review: "Powerful coming of age tale." "A powerful coming of age tale with heroism and courage. The level of perception and sensitivity is not only convincing but haunting. Tardif again leaves a lasting mark on her readers. Her story promises to follow long after ending. This is the second book I've read by Tardif and each one grabbed me and wouldn't let go even after I'd completed the last page. It's one of those books which stops time and leaves you hungry for more. Moving and irresistible." Whale Song review: "I purchased more to give to family and friends." "I loved ‘Whale Song’. It encompasses so many of life’s experiences…from loss to hope, from sadness to joy, from frustration to compassion. Cheryl is an authentic down to earth writer. She writes about so many of today’s current issues …bullying, racism, the dying, euthanasia, respect for our earth, commitment… in an understanding and intelligent way. I enjoyed the book so much I purchased more to give to family and friends." Whale Song review: "Kept me entertained throughout." "Great book...and I heard about it from Goodreads! Cheryl Tardif captured what it feels like to lose someone you love and so many of the different emotions you go through. She also captured an accurate portrayal of a girls adolescence--like the first kiss of an 11-year-old; that was very cute. This was a short, quick read that kept me entertained throughout."